Pike Blog: The Wye - A Twenty! 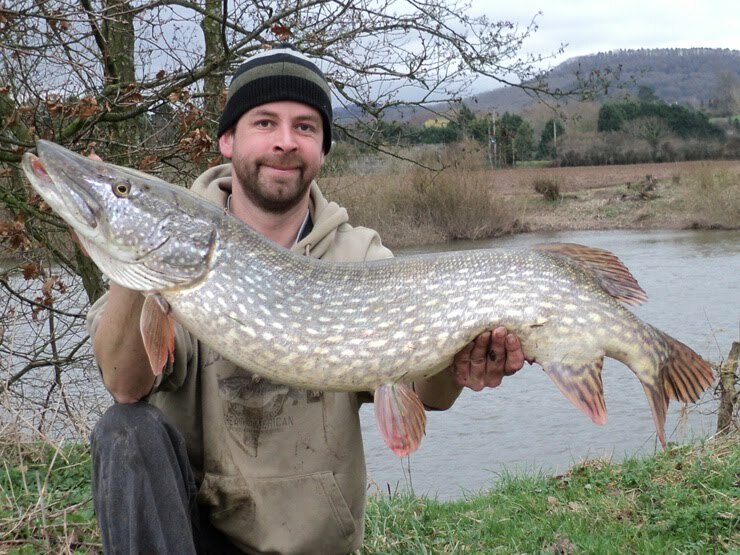 Today saw the start of a long weekend on the Wye, with only one pike on the board and only a couple of weeks left of the season, I need to get a move on... I arrived yesterday evening, so that first thing this morning myself and Roger could head to some out of the way River Wye. We planned to fish a selection of dead baits (and I brought some plugs). 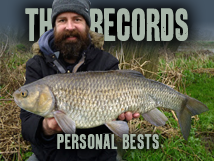 I was first into the action, after about an hour, with a run on a float-fished tiny 2" sprat, I struck and all went solid, I thought I was stuck in a snag until a powerful surge and I realised I was into a good fish. 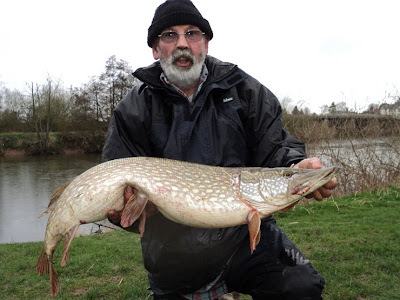 The pike made several powerful runs before we saw it, and as it came over the net we knew it was a twenty or very, very close. As Roger lifted the net there was a loud rip and the pike disappeared back into the water - the pike was still in what was left of the net and the net was still connected to the string between the spreader arms - not sure how we did it, but we managed to lift it onto the bank. A beautiful pike that went 20lb 2oz, only my second fish of the season and a twenty! Yay! 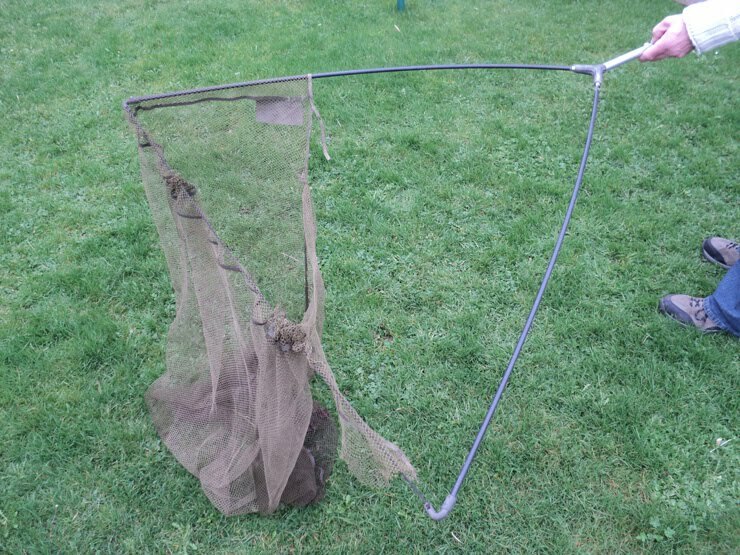 And a landing net that was beyond repair. 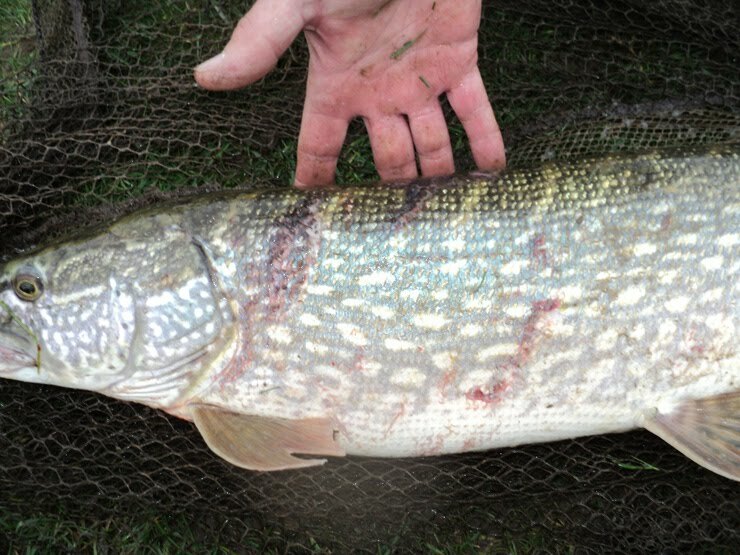 A new landing net was sourced and delivered to the river bank within the hour (thanks Mum) and fishing continued. We leapfrogged our way between swims fishing sprats and herring and Roger was into the next pike on a sprat, this one went about a pound. 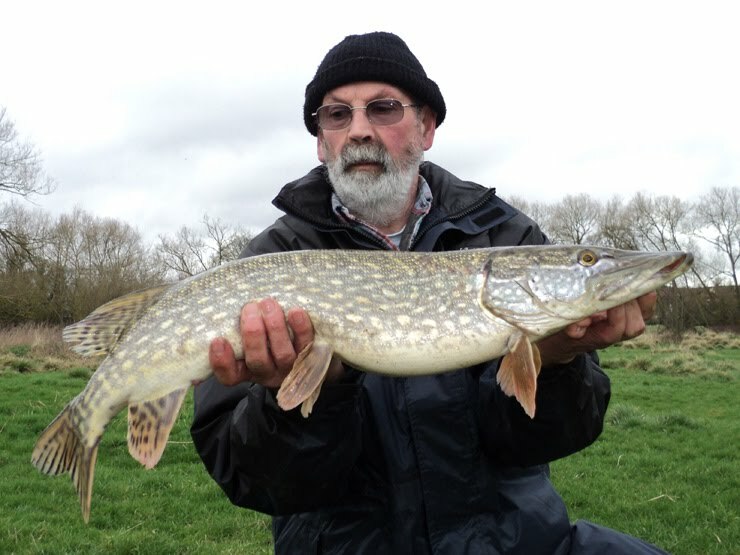 We followed this with a 8lb 15oz pike to me (sprat), 7lb 10oz pike to Roger (sprat), 2lb approx to me (sprat) and 11lb 8oz to Roger (sprat). In fact we didn't get a run on herring all day. 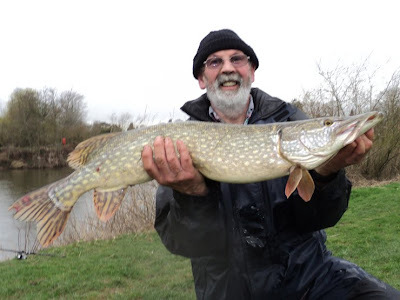 Roger had the last run of the day on dead bait (sprat again) and landed a 14lb 8oz pike, his biggest of the session - despite being a good double figure fish it had very large, very fresh tooth marks across it's back - I wonder how big the pike was that inflicted these? I want to meet her! 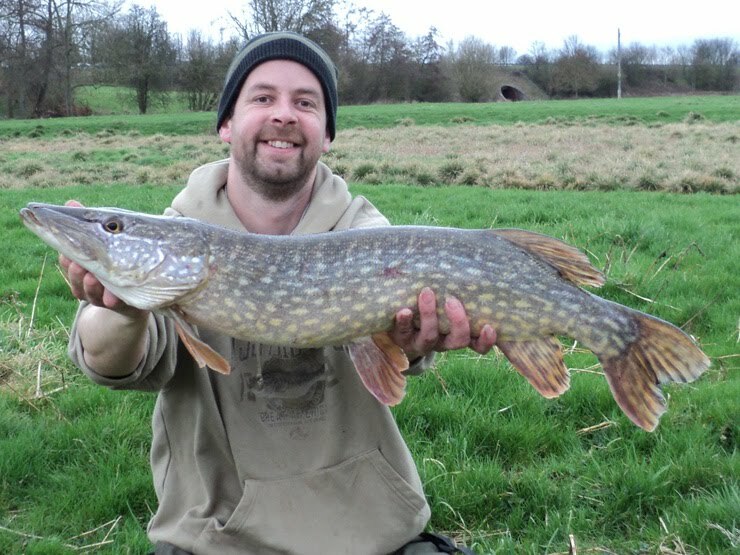 With the scores on the doors being: Roger 4 pike, me 3 pike, I fished on until dark with a plug. I had been plug fishing as well as dead baiting most of the day, with a few follows. And just as we decided to leave I had one about 3lb. Four all, great day and a twenty! Sorry, no photos - I forgot to bring the USB thing. Doh! 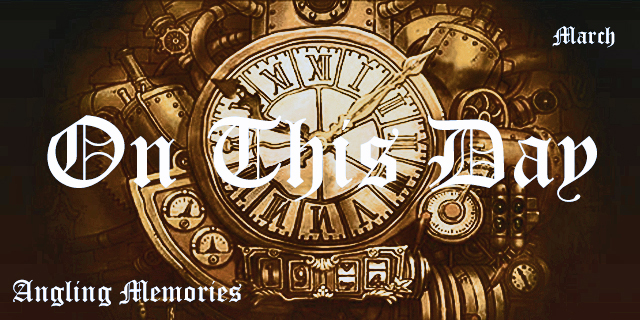 Photos added! The fresh tooth marks in the 14lb 8oz. And what was left of the original landing net! Pictures, pictures......Well done to you both. You can spot a good fishing family when you can get Mum to bring you a new net mid session! But will she pick the maggots out of the carpet when Rog drops them!!!! !